As you read, you slowly grow aware that the book’s real object of fascination isn’t the various sicknesses described in its pages, but the sickness inherent in their arrangement... This mad project is clearly something that its authors are fixated on to a somewhat unreasonable extent. In a retrospectively predictable ironic twist, this precise tendency is outlined in the book itself. The entry for obsessive-compulsive disorder with poor insight describes this taxonomical obsession in deadpan tones: “repetitive behavior, the goal of which is […] to prevent some dreaded event or situation.” Our narrator seems to believe that by compiling an exhaustive list of everything that might go askew in the human mind, this wrong state might somehow be overcome or averted. References to compulsive behavior throughout the book repeatedly refer to the “fear of dirt in someone with an obsession about contamination.” The tragic clincher comes when we’re told, “the individual does not recognize that the obsessions or compulsions are excessive or unreasonable.” This mad project is so overwhelming that its originator can’t even tell that they’ve subsumed themselves within its matrix. We’re dealing with a truly unreliable narrator here, not one that misleads us about the course of events (the narrator is compulsive, they do have poor insight), but one whose entire conceptual framework is radically off-kilter. As such, the entire story is a portrait of the narrator’s own particular madness. With this realization, DSM-5 starts to enter the realm of the properly dystopian. The restrictions on what people entering, leaving or having the fortune to reside in the Olympic zone wear or carry on their person are supposedly to prevent rival brands from playing “ambush marketing” stunts, such as sponsoring covert flash mobs of people dressed in their logo colours. It is not clear whether a bunch of people wearing Chicken Cottage T-shirts would impair McDonalds' image, though it seems that Olympic sponsors insult easily, and when offered the full might of the state and extraordinary police powers to do so, are willing to jump at the offer. It would be amusing if it didn't trample on the rights of free expression and free association. In a free society, one might argue that there are certain extreme contingencies when the usual freedoms need to be temporarily suspended for the common good. That it may be justifiable to do so to soothe the tender egos of a multinational corporations' marketing departments at a sporting event is a considerably more dubious proposition. Meanwhile, the (London) Metropolitan Police, who were escorting the Olympic torch rally through Cornwall, seized a Cornish flag carried by a torch-bearer, on the grounds that it was a “political statement”. And as ominous as the Olympic mascots are (they're essentially anthropomorphised surveillance cameras, executed in a hip-hop aerosol-art fashion, sublimating the appropriation of the superficial aspects of underground/“street” culture into an architecture of surveillance and control and subtly, or not so subtly, alluding to London's heritage as a world leader in CCTV coverage), some pieces of official merchandise are more ominous than others; take the mascot in a policeman's costume. It's not clear whether the Orwellian connotations are unintended or whether they're a deliberate acknowledgement of London's status as a model panopticon. After all, there will be a lot of foreign dignitaries at the Olympics, some from countries with, shall we say, more fraught internal situations than others, and if the Olympics go smoothly, with no evident dissent and no obvious sign of dissent being heavy-handedly crushed, this could result in a lot of sales by British security technology vendors. Pay & Sit is a user-pays park bench. 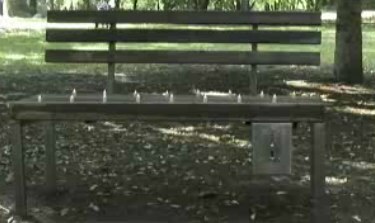 The bench contains metal spikes embedded in the sitting surface, which are retracted when the user inserts 0.50€ into a coin box; the bench beeps when the sitting time is about to expire. Pay & Sit is not an actual product, however, but the work of an artist named Fabian Brunsing, commenting on the logical extremes of user-pays culture and/or the privatisation of public space. There is no guarantee, however, that some local authority (or some firm contracted to manage (privatised, ad-funded) public parks by one) won't try something like that at some point. Work enough weekends under constant threat of downsizing, maybe any of us would look like that. Maybe. Get downsized enough times, then one last time in a world where white-collar work is over, and maybe you'll look like the woman in the next cubicle across. Which is to say: crying silently and either not knowing or caring and just carrying on. And the next cubicle, and the next: scuffed and fading grey partitions repeating like an exercise in perspective, straight lines along and across the concrete floor of a factory that hasn't had machinery for thirty years: closed and cleared in the last recession, or maybe the one before that. Look closer and there's no lamps or work lights in the cubes. None. Four of them - the corner offices - are lit by the blue flicker of a monitor. The rest are not: these people are 'working' in front of dead screens, tapping away on keyboards that may or may not be plugged into the silent metal boxes underneath the desk. Some of the 'monitors' are cardboard boxes, sideways-on. People have been shot for coffee: it's the currency of choice for criminals, and we don't touch it. Our trade is bread-and-butter materials recovery, digging through the garbage and extracting lead for roofing, paper and cardboard for compression into pellets; these bulk commodities, like the gas and water, are the currency for a regular supply of food and nowadays some biodiesel. Higher-value items - tools and wheel-bearings and plastic sheeting - are tradeable for spares and welding gas but it's slow: we have a network and a market, but bartering depends on luck - without a formal currency, you have to have the thing they want, and they have to have the thing we want, both in the same place at the same time. It's frustrating and it isn't getting any better. I have absolutely no idea who's supplying food to the 'Office Workers', or why; Médecins Sans Frontières provides a monthly clinic on the local round but there's no way they can be supplying all those people with antidepressants or tranquillisers... Is there? We supply the gas and water because the doctor's round will stop if we can't keep up a 'population centre'. The patent says: "User dialogue (eg from role playing games, simulation games, etc) may be used to characterise the user (eg literate, profane, blunt or polite, quiet etc). Also, user play may be used to characterise the user (eg cautious, risk-taker, aggressive, non-confrontational, stealthy, honest, cooperative, uncooperative, etc)." Players who spend a lot of time exploring "may be interested in vacations, so the system may show ads for vacations". And those who spend more time talking to other characters will see adverts for mobile phones. Not all the inferences made by monitoring user activity rely on subtle psychological clues, however. "In a car racing game, after a user crashes his Honda Civic, an announcer could be used to advertise by saying 'if he had a Hummer, he would have gotten the better of that altercation', etc," the patent says. And: "If the user has been playing for over two hours continuously, the system may display ads for Pizza Hut, Coke, coffee." Data collection in 1984 was deliberate; today's is inadvertent. In the information society, we generate data naturally. In Orwell's world, people were naturally anonymous; today, we leave digital footprints everywhere. 1984's Big Brother was run by the state; today's Big Brother is market driven. Data brokers like ChoicePoint and credit bureaus like Experian aren't trying to build a police state; they're just trying to turn a profit. Of course these companies will take advantage of a national ID; they'd be stupid not to. And the correlations, data mining and precise categorizing they can do is why the U.S. government buys commercial data from them. And finally, the police state of 1984 was deliberately constructed, while today's is naturally emergent. There's no reason to postulate a malicious police force and a government trying to subvert our freedoms. Computerized processes naturally throw off personalized data; companies save it for marketing purposes, and even the most well-intentioned law enforcement agency will make use of it. Imagine a society where cities blend into each other to form massive conurbations. Imagine a society where obesity is rife, mass unemployment is a fact of life and downtrodden citizens will do anything to become rich or famous. Imagine a society in the grip of such chaos and crime that it is necessary to give law enforcers the power to punish offenders on the spot without a trial and where everyone is constantly surveyed by video cameras. As Britain has toyed with the idea of giving police officers more and more authority, the papers have talked of "an army of Judge Dredds" and "Judge Dredd powers". The next big thing after Digital Rights Management could be Attention Rights Management, or technologies to ensure that users of advertising-supported services not only see the ads but pay attention to them. Already, Microsoft have applied for a patent on a technology for enforcing the payment of attention, using CAPTCHA-style tests and face-recognition cameras. Perhaps we can expect to see this as part of the DRM layer in the version of Windows that follows Vista, opening further opportunities for premium content consumption? Defense contractors in the US have developed a gun-mounted system for recognising enemies. The system consists of a camera mounted on a rifle, attached to a backpack computer which recognises and keeps a database of faces; it can alert the soldier to the same face showing up in a variety of trouble spots (i.e., a troublemaker), or being on a pre-supplied list of bad guys/terrorists/ornery varmints. Perhaps they could even attach it to the gun's trigger, so then all you'd have to do is sweep the gun over a crowd and it'd automagically shoot the right people. Now if they combined this technology with the fleets of swarming aerial drones and carnivorous robots, then we'd really be getting somewhere.